Star Trek Minutiae was less than a year old when I decided to play an April Fools’ Day prank. I’m not a huge fan of the types of website pranks where deliberate misinformation is published (like many reputable news sites like to do these days), but I wanted to do something amusing and memorable. And inspiration hit: change all the images on my home page to something completely ridiculous, while still leaving all the content intact. 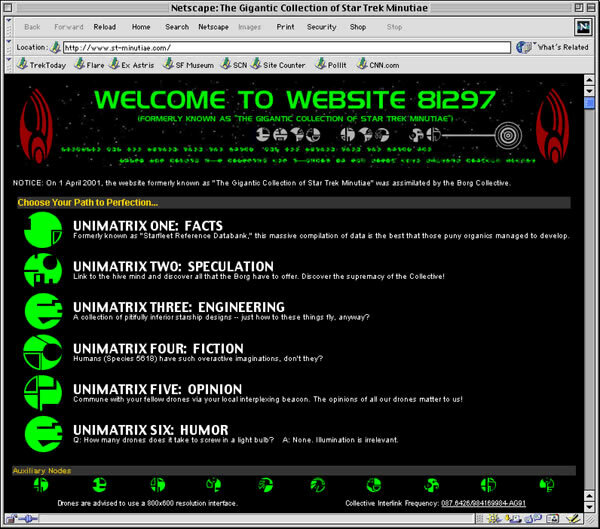 And so, on April 1, 2001, Star Trek Minutiae became “Website 81297” when it was assimilated into the Borg Collective!